When I stopped by the Florence Griswold Museum during a snowstorm in mid-March to see Peter Halley’s retrospective, the glowing neon color and interlocking geometric forms – what he has called cells, prisons (that is, rectangular sets of prison bars), and conduits – had transformed the museum into a dazzling chamber of vibrating light. This extraordinary exhibition, “Peter Halley: Big Paintings,” consists of nine monumental paintings made between 1987 and 2015 that take abstraction beyond the utopian ideals of early modernism and address the isolation and control imposed by government and corporate interests on our everyday lives. Peter Halley, Two Cells with Conduit, 1987, acrylic flourescent acrylic, Flashe and Roll-a-Tex on canvas, 78 x 155 inches. Peter Halley, Cartoon Network, 1997, acrylic, fluorescent acrylic, metallic acryilic, and Roll-a-Tex on canvas. 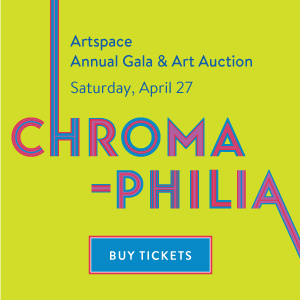 Halley’s visual language – the square, the line, and other geometric forms – is appropriated from modernist painters like Malevich and Mondrian. But rather than a celebration of, or an indulgence of nostalgia for, Modernist “progress,” Halley’s abstraction symbolizes the unstoppable influence of Big Brother in various forms. Influenced by French philosopher Michel Foucault’s 1975 book Discipline and Punish: The Birth of the Prison, Halley understands that corporations usurped the Modernist agenda as a means of generating greater efficiency, and thus larger profit margins. We wouldn’t have big-box stores like Walmart and Home Depot blighting the landscape if Modernist architects like Mies van der Rohe hadn’t made stripped-down form and industrial materials seem progressive and appealing. Jean Baudrillard’s notion of “hyperrealization” suggests that everything becomes bigger over time: multi-family houses are replaced by huge apartment complexes, country roads by superhighways, and, now, regional community life by online global interaction. At left: Peter Halley, Laws of Rock, 2008, Acrylic, fluorescent acrylic, Roll-a-Tex on canvas, 75 x 122 inches. 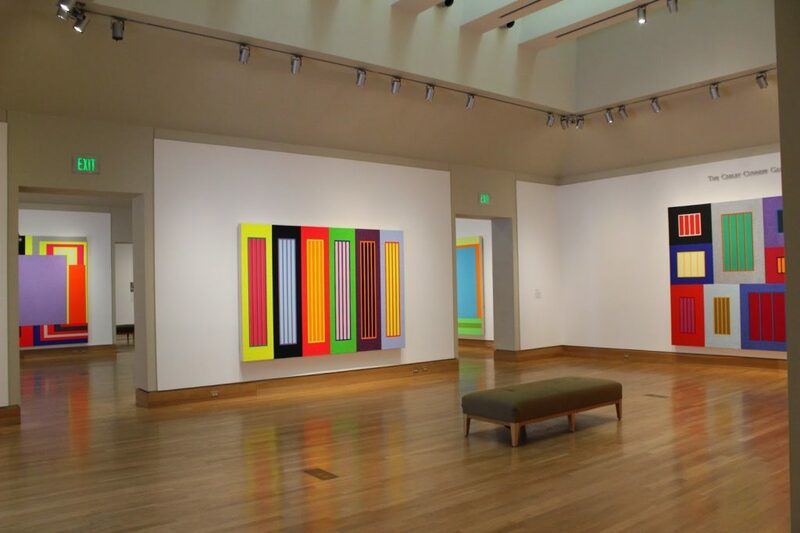 At right: Peter Halley, Clockstoppers, 2002, Acrylic, fluorescent, metallic, Pearlescent acrylic, and Roll-a-Tex on canvas, 96 x 115 inches. 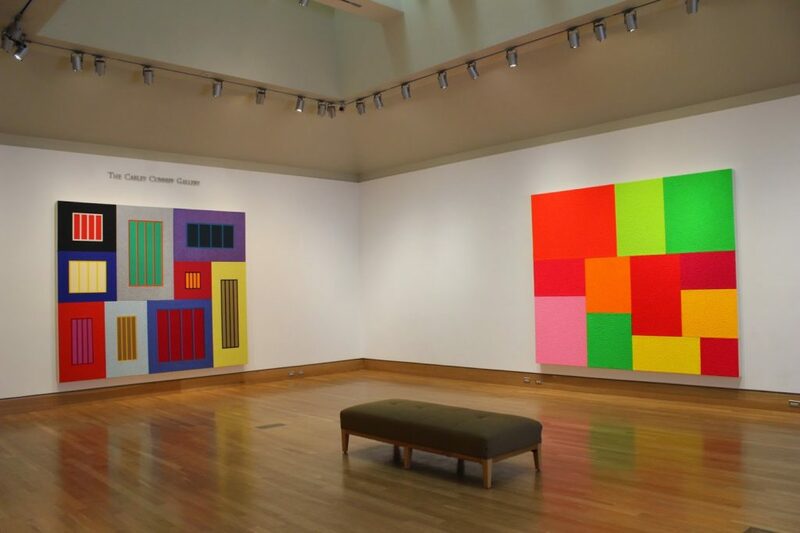 At left: Peter Halley, Clockstoppers, 2002, Acrylic, fluorescent, metallic, Pearlescent acrylic, and Roll-a-Tex on canvas, 96 x 115 inches. 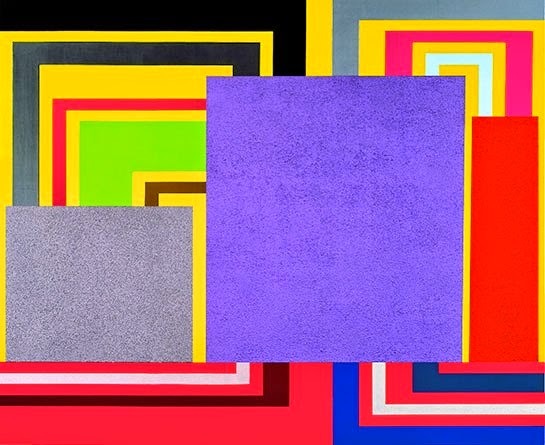 At right: Peter Halley, Accretion, 2015, fluorescent and Roll-a-Tex on canvas, 95 x 112 inches. For Halley, these developments, and our increasing reliance on technology for the simplest everyday tasks, imposes a level of abstraction on our lives that benefits corporations at the expense of the individual and the social landscape. Although his shapes may come from a long tradition of abstraction, the shrill Day-Glo pigments Halley has used since the 1980s are mainstays of product packaging and the RGB color space of video gaming and online life; they place his paintings firmly in the present. 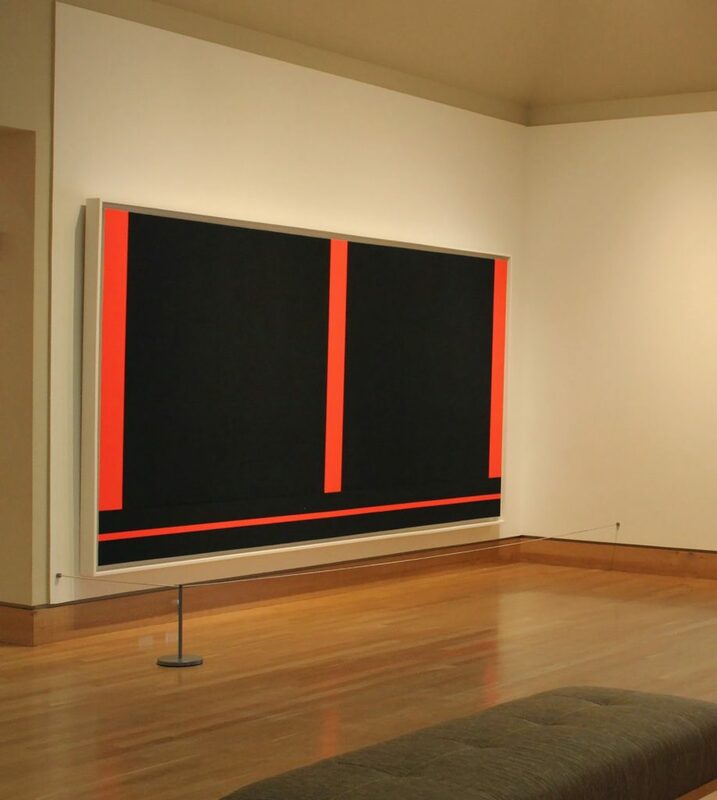 In Halley’s earliest painting in the show, Two Cells with Conduit from 1987, four red-orange fluorescent stripes divide a black ground into three distinct spaces. By 1991, in The Acid Trip, Halley’s early austerity gives way to a more complex, lively palette. 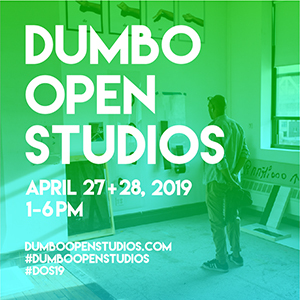 The vocabulary of discrete cells and longer linking conduits takes on a happier affect as the shapes begin to interact, overlapping and connecting. In Cartoon Network (1997), the cells and prisons are no longer equal size; a hierarchy is forming. The conduits, located behind the cells, become more organized and begin to gain equal importance. By 2002, Halley has returned to a flatter space and eliminated the overlapping shapes. In Clockstoppers, prisons of various sizes are locked in solid rectangular interlocking forms, eliminating conduits altogether. Panic Room presents one large cell positioned over a series of conduits that face the edges of the canvas rather than its center. By 2008, the prisons, recalling Halley’s earliest painting in the show, have again become the same size. In Laws of Rock, six tall, thin prisons, each a different color, without conduits, are centered in colored blocks and positioned side by side. In the last painting, Accretion, painted this year, the cells take on irregular shapes and sizes and the conduits, perhaps because they are no longer necessary to build connections in our wireless world, have disappeared. Halley’s strict visual language is clear enough and his political underpinnings are well documented. Yet his nine enormous paintings, with the shifts in the shapes, sizes, and configuration of their three primary geometric elements, also seem to embed a subtle narrative about his personal confrontation and accommodation of the political and social evolution his paintings more overtly reflect. So perhaps the most remarkable achievement of Halley’s work is its seamless fusion of political and personal content. His formalism pulses with life itself. 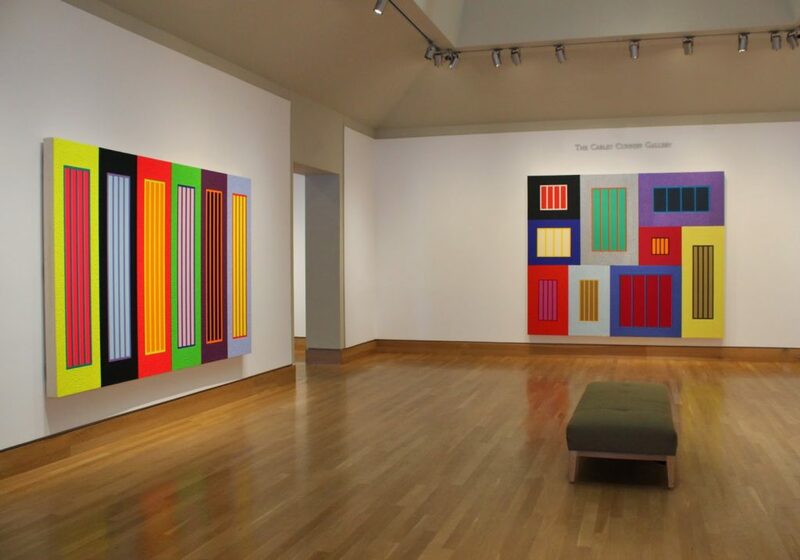 “Peter Halley: Big Paintings,” curated by Benjamin Coleman, Florence Griswold Museum, Old Lyme, CT. Through May 31, 2015. In conjunction with the exhibition, Edgewise Press has published Peter Halley, Selected Essays, 1081-2001. Having just finished reading it, I’m struck by the timeliness of Halley’s ideas. 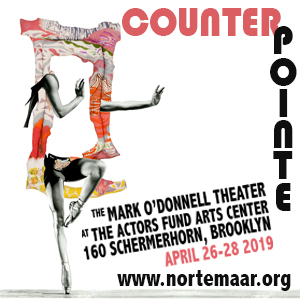 The book includes texts from Collected Essays 1981-198, published originally in 1988 by Bruno Bischofberger Gallery, and again in 1991 by Sonnabend Gallery. In 1997, Edgewise published Recent Essays 1990-1996. Many of the essays originally appeared in index magazine, an art journal Halley published from 1996-2005. I highly recommended Halley’s essays—all contemporary abstract painters should appreciate them, especially “The Crisis in Geometry,” “Notes on Abstraction,” “Geometry and the Social,” and “Abstraction and Culture.” Definitely worth a read (or reread if you read the essays when they were originally published). It is odd that what appears to be a critically extreme gesture as in Halley's latest work can be so easily co-opted into the overall dialectic of contemporary techno reality.Even the Negative Dialectic of Adorno cannot put a stop to this constant synthesizing of antitheses. What is headache inducing and seems to be a visual point beyond which one could never imagine surpassing becomes just another zig zag toward total technological enframement.